Donovan Mitchell entered this season with stratospheric expectations — and aspirations. This was only natural. Mitchell had become the most celebrated rookie prospect in the history of the Jazz franchise. Slam Dunk Champion. The only rookie to lead a playoff team in scoring since Carmelo Anthony. The guard to displace Michael Jordan’s record for points scored through two playoff games. The only rookie to claim a spot next to Kareem Abdul-Jabbar1 in scoring 20 or more in each of his first six playoff games in the last 50 years. By the time Mitchell’s inaugural season was done, he was already widely seen as a superstar in the making. This, perhaps naturally, led to the expectation that his next season would be even better. For a while — an uncomfortably long while for many fans — that simply wasn’t true. 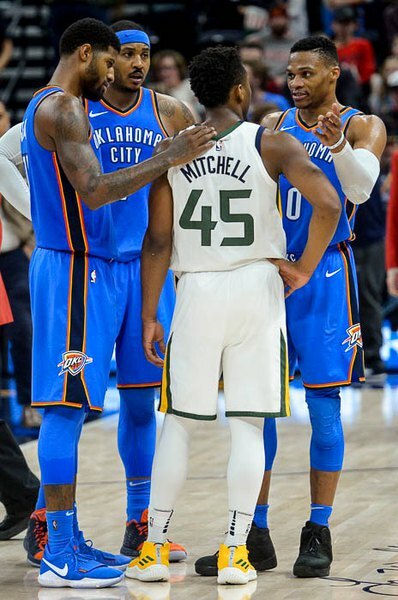 Atop scouting reports and at the center of opponents’ defensive schemes, Mitchell stopped receiving praise and handshakes from the NBA’s elite talent; instead, he faced determined focus to put the young prospect in his place. Though December, Mitchell struggled with his new prominence. While he managed to essentially replicate his scoring as a rookie, generating a healthy 20.1 points per game, his efficiency — which was already a point of vulnerability in his game — dropped to problematic levels. His shooting percentage dropped both from the field — 43.7 to 41.1 percent– and from three — 34 to 29.3 percent. At the same time, his rebounding and assists both decreased slightly from his rookie year. To say anything but that Mitchell’s sophomore campaign was a slight disappointment would be dishonest. No one recognized this more than Mitchell himself, whose attitude was never clearer than after an embarrassing performance against the 76ers in which he scored 31 on 35 shots without managing a single assist. That night, Mitchell declared in disgust, “That’s not who I am.” It was the same thing the young star must have been telling himself all season as he fought to learn how to better shoulder the huge burden he carried. Whether in studious film study with Jazz coaches or in long phone conversations with Dwyane Wade about how to play through injuries, Mitchell’s dissatisfaction with his game was clear. He wasn’t quite living up to what anyone, himself most of all, believed he could be. Such sophomore slumps are common. Jayson Tatum, the Celtics rookie phenom often mentioned with Mitchell as the class of their (very strong) draft class, has endured similar and perhaps even more significant struggles in his second season. The path to superstar status in the NBA is rarely predictable and linear, and Mitchell was taking his lumps against the best players in the world. But that slump is over. In 2019, Mitchell has once again risen above any realistic expectations anyone might have had for him. Since January 1st the Jazz have played 22 games, about a quarter of an NBA season, and in that span Mitchell has scored 26.7 points per game. Only eight players in the league have scored more per contest in that span. Those with a plus-minus better than Mitchell’s plus-5.5 make up a bulk of the MVP race: Paul George, Joel Embiid, Stephen Curry, and Giannis Antetokounmpo. While still not as efficient as the league’s established superstars, Mitchell has returned to his respectable rookie-level true shooting percentage around 54 percent during the stretch. Moreover, his game has expanded. He’s averaging a full five assists per contests along with a healthy 4.6 rebounds in 2019. Just how well is he playing? If he were to continue that production over the course of a full season2, he would join only nine players to manage the feat in the past decade. Six of those players are league MVPs. There’s also every reason to believe Mitchell’s efficiency will improve in the future. He’s still only 22 years old, yet his 32.2 usage percentage in 2019 is fifth highest in the entire league. Only James Harden (age 29), Joel Embiid (nearly 25), Kevin Love (30), and Lou Williams (32) carry heavier loads when it comes to using a huge number of their team’s possessions. Embiid and Love are bigs so the comparison offers relatively little meaning, but Harden and Williams are much better parallels. At what age did each of these guards first face usage demands over a full season as huge as Mitchell has the past two months? Harden was 26 and settling in as Houston’s Mr. Everything and perennial MVP candidate. Williams has never born such a load until this season, not for a full year. What Mitchell has done the past two months is incredible enough it’s hard to find parallels for players at his age and experience level. Two common players associated with Mitchell are Dwyane Wade and Damian Lillard. Wade was 23 his second year in the league and produced 24.1 points per game with a usage just under 31, which is about as close a case study as one can find. Lillard, on the other hand, has never sustained a usage as high as Mitchell’s recent load over the course of a full season. Mitchell will continue to learn the NBA game and how to manipulate it. He’ll fine tune his skills and refine his shot selection. There’s also a good chance he’ll add to his reputation with referees, which already has him taking 6.3 free throw attempts a contest the past few months. Also, if Utah’s plan comes to fruition, Mitchell won’t have to shoulder the massive load he currently bears in such isolation. It’s no secret the Jazz want to add a quality secondary offensive option to their core of Mitchell and Defensive Player of the Year Rudy Gobert. If they manage to bring in a player to draw some of the weight and attention off of Mitchell, his efficiency will almost certainly benefit, and it’s possible his usage may even dip some. Yet even if it doesn’t, Mitchell is showing he’s capable of holding up under the full burden of superstar expectations. Best of all, the Jazz are 15 and seven in the 22 games Mitchell’s gone interstellar this year. Can he keep it up? Can he really be this good, game in and game out, season in and season out? And if so, when can be reach that height? Those are questions the ceiling of the Jazz franchise hangs on. But one question has been definitively answered: yes, Mitchell has blown through his sophomore slump, and he did so in a BIG way. Clint Johnson is a professional author, writing educator, and editor. He teaches writing at Salt Lake Community College. A frequent presenter at both writing and educational conferences, he writes about the Jazz as a break from his other writing work. Named Lew Alcindor at the time. And it’s far from certain his development will ever reach that level of consistency across such a challenging span of time.